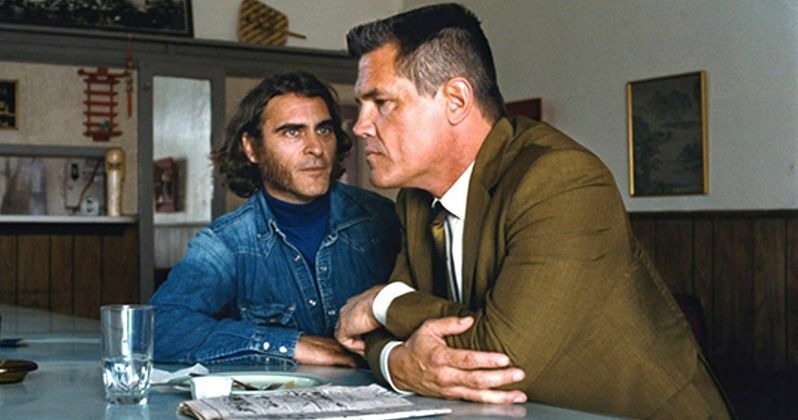 Entertainment Weekly has our first look at Joaquin Phoenix and Josh Brolin in Paul Thomas Anderson's Inherent Vice. Based on Thomas Pynchon's 2009 novel, the movie is described as a 'psychedelic crime romp'. "With Paul, he's interested in what might happen, not what should happen. He doesn't walk onto set with a clear goal. That can be...surprising. It didn't feel chaotic; it felt thrilling. The set felt really vital. Like you are going into a question together." "With this [film], there was a lack of pretense-a really strange lack of pretense. When something isn't working, you can say, 'This feels like a turd. Let's cut the middle three pages. I'll try to improvise and provide a bridge. How about some pancakes?'" "I'm not joking about the pancakes. Many, many pancakes. By the end of the day, you're shaking so much because you've eaten so many pancakes, you know you're going to be diabetic in the next 24 hours." "A piece of fruit plays a major role. It's frozen. And it's my friend. Even talking about it now is making me chuckle... It's Cirque du Soleil more than pretentious filmmaking."